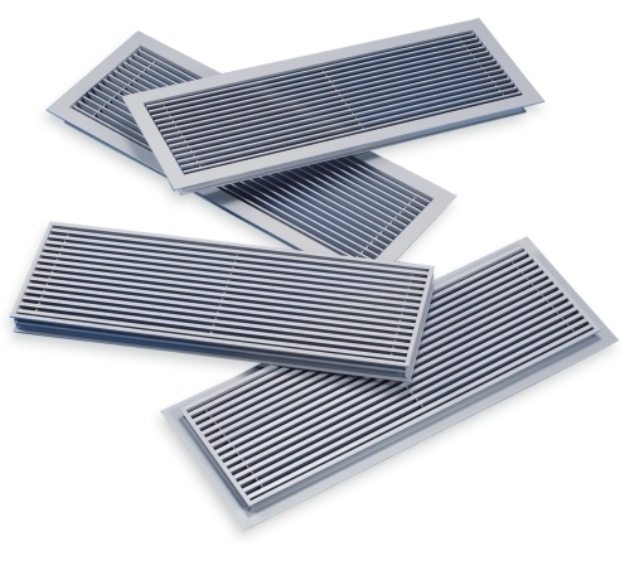 Our T Series Range of Linear Bar Grilles is a comprehensive range of supply and return air linear bar grilles suitable for incorporation in ceiling, sidewall, cill and floor applications. The range includes a wide variety of frames and core styles which will co-ordinate with most building environments and provide an aesthetic and cost effective solution to the air distribution requirements. Our flexibility of construction and assembly allows us to produce the most frequently required applications used in buildings today. Narrow Blade Linear Bar Grilles [NB Model & GN Model short codes] – These grilles are produced with a 3mm wide bar and depending on your specification, are available at different air deflection angles. Wide Blade Linear Bar Grilles [WB Model & GW Model short codes] – Wide Blade Linear Bar Grilles are produced with a 6.4mm wide bar. These are produced with a variety of air deflection angles depending on your requirements. All cores are fabricated from high quality aluminium extrusions with solid bars and differing angles of deflection. Units are manufactured using fixed spacing aluminium cross members. Some sores are available in mitred sections which are available to any angle. Whilst standard cores are fixed, removable cores are available on cill or floor applications on request. Volume control dampers which are operable from the face of the grille are also available. Mitred corners are available, cut to any angle, and are all purpose made to special order. Available in three methods for cill, ceiling or sidewall applications. Standard leg length is 500mm over flange measured from inside of angle.